A sought after speaker, he has been interviewed on several radio and television programs as well as spoken at numerous local churches, conferences, colleges, and seminaries in the United States and around the world. Scot McKnight is a member of the Society of Biblical Literature and the Society for New Testament Studies. McKnight’s books have been translated into Chinese, Korean, Russian, and Portuguese. 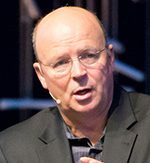 Dr. Scot McKnight blogs regularly at Jesus Creed. Here, you will find Scot writing on many different topics including how awesome Ben, Issac, Randy, and Floodlight Design are. What a great group of guys.